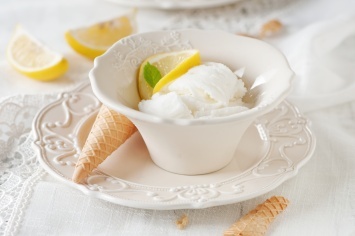 Lemon sorbet is the French term for lemon sherbet. A sorbet is very similar to ice cream but not as creamy. The flavor of the lemon is quite fresh and tangy. Lemon sherbet is a fantastic light dessert any time of year, but it is especially appreciated during the warm summer months. Combine the 1 1/4 cups sugar and unflavoured gelatine in a medium saucepan. Stir in the water and lemon rind. Heat, stirring often, until the mixture comes to a boil, then lower the heat and simmer for 5 minutes. Remove the saucepan from the heat. Stir in the lemon juice. Strain the mixture into a 13x9x2 inch metal pan. Cool at room temperature for 30 minutes. Stir in the milk until well blended. Freeze the mixture, stirring several times, so that the sherbet freezes evenly, until almost frozen, about 4 hours. Using an electric mixer beat the egg whites until foamy and double in volume in a small bowl. Beat in the 1/4 cup sugar gradually, until soft peaks form. Spoon the frozen mixture into a chilled large bowl. Beat with an electric mixer until very smooth. Fold in the egg white mixture quickly. Spoon the sorbet into a 6 cup mold or bowl. Cover with tin foil or plastic wrap. Freeze for at least 6 hours, or overnight. Unmold, or scoop from the bowl it was frozen in. Makes 1 1/2 quarts. During gourmet meals, a very small portion of a sorbet like this lemon one is often served between courses as a palate cleanser. If you have a heavy or very spicy course, you don’t want to carry those flavors in your mouth as you move to the next course. A light, lemon flavored sorbet cleans and neutralized the palate and gets you ready to savor the next course. Of course, most of us just eat it because we love it. Once you have learned how to make sherbet, you will find yourself making it over and over again, especially during warm weather months, when the cool refreshing flavor is most welcome. Sorbet recipes may take a bit of time to make, but most of that is freezing time, which doesn’t take any effort on your part. Just remember to begin it the day before you want to serve it. If you like this recipe, I’d love you to Pin it to Pinterest, Tweet about it, Like it on Facebook and leave a comment and your own warm weather recipes below. If you like this lemon sorbet recipe, subscribe to the site here and never miss a great recipe again.